With the latest release of NVIDIA's RTX ray-tracing laptop chips, any manufacturer can make a fast and lightweight laptop. To stand out now, you need to try something new, so this year at CES 2019, the focus was on displays and eccentric designs. Dell and HP showed that the future of gaming and multimedia laptop panels is both brighter and faster. 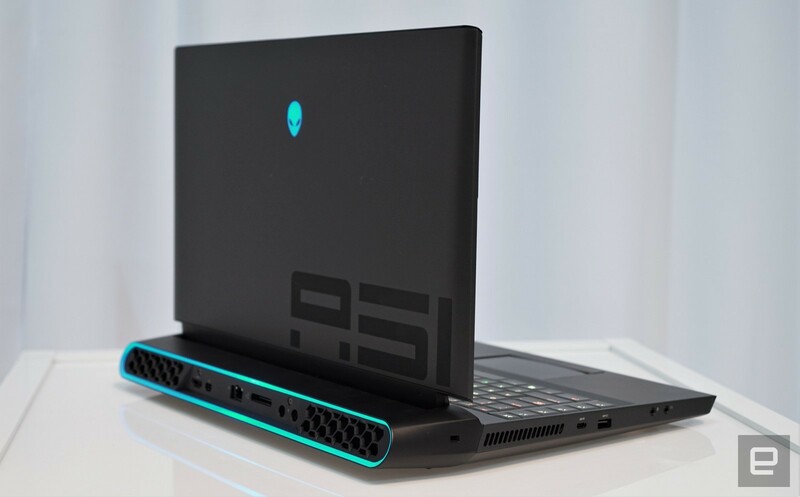 Alienware's laptop featured an upgradeable CPU and GPU, ASUS unveiled an all-in-one-like ROG laptop and Acer's Predator Triton 900 had a singular hinge and exorbitant price tag. At the same time, there were many excellent-looking new models rocking NVIDIA's latest chips. Without further ado, here's a roundup of everything we saw. When it unveiled the Omen 15 (above), HP thought it was announcing the first ever laptop with a 240Hz display. That wasn't quite the case (more on that in a second), but it was an impressive reveal nonetheless. The Omen 15 will ship in July with a 15.6-inch, 1080p 240Hz panel with G-SYNC, an Intel i7-8750H CPU, 802.11ax wireless and NVIDIA RTX 2070 Max-Q graphics. All of that tech fits into a 5.2-pound body, so it'll be a powerful gaming machine you can take anywhere. We haven't heard the price yet, but cutting-edge tech usually ain't cheap. HP also announced that it would release the first 15-inch laptop with an AMOLED display, the Spectre x360. It will deliver 33 percent more colors than regular sRGB screens and boast a superb 100,000:1 contrast ratio. That will make it a great content creation PC, and it will also get a high-end Intel 8th-generation CPU and NVIDIA RTX graphics. If portability is more your jam than gaming, HP also released a 4K version of the Spectre Folio, a Surface-like laptop clad in leather rather metal. Alienware got the jump on HP by unveiling the m15 lightweight gaming laptop, which also has a 240Hz display and will arrive in March, ahead of the Omen 15. It will be lighter and more powerful thanks to a Core i9 CPU and GeForce RTX 2080 Max-Q graphics, and weigh in at just 4.76 pounds. For content creation, it will also be available in March with an OLED display. The 17-inch, 5.8 pound Alienware m17 will be similarly equipped, but without the OLED and 240Hz display options. Alienware took a walk on the wild side with the Area 51M. The 17-inch laptop is about pure power and versatility, giving enthusiasts the rare ability to upgrade both the CPU and GPU. You won't need to do that for a while, though, as it already has stellar specs with Intel's Core i9 CPU and an NVIDIA RTX 2080 GPU. The Area 51M will start at $2,549 when it arrives on January 29th. Dell unveiled the latest XPS 13 model with a new design. The 13.3-inch will be available with a very bright (400 nit) 4K HDR display that supports Dolby Vision, a first for a Dell laptop. It has tiny bezels, weighs in at just 2.7 pounds, and can go up to 21 hours on a charge. If you're looking for a bigger PC, the XPS 15 will soon pack an OLED display, HP said. The XPS 13 is available today starting at $900, but expect to pay more for the Dolby Vision model. For 2-in-1 fans, Dell unveiled its Latitude 7400. It's the first model with Intel's Proximity sensor that logs you in automatically when you approach the device. It's tiny for a 14-inch laptop, weighing in at just three pounds, thanks to the tiny bezels and aluminum shell. It'll start at $1,599 when it arrives in March, 2019. Dell's G-series gaming laptops got a huge boost, with the G7 15- and 17-inch models now packing NVIDIA RTX 2080 Max-Q graphics and up to Core i9-8950HK 6-core CPUs. They come with 144Hz 1080p displays and you can get the 15-inch model with a 4K 60Hz OLED touch display. The latest G5 15/15 SE models, meanwhile, pack up to 8th-gen Intel i7 CPUs and NVIDIA RTX 1070 Max-Q graphics. They'll go on sale January 19th starting at $999 (G5 15), $1,099 (G7 15-inch) and $1,380 for the G7 17-inch laptop. 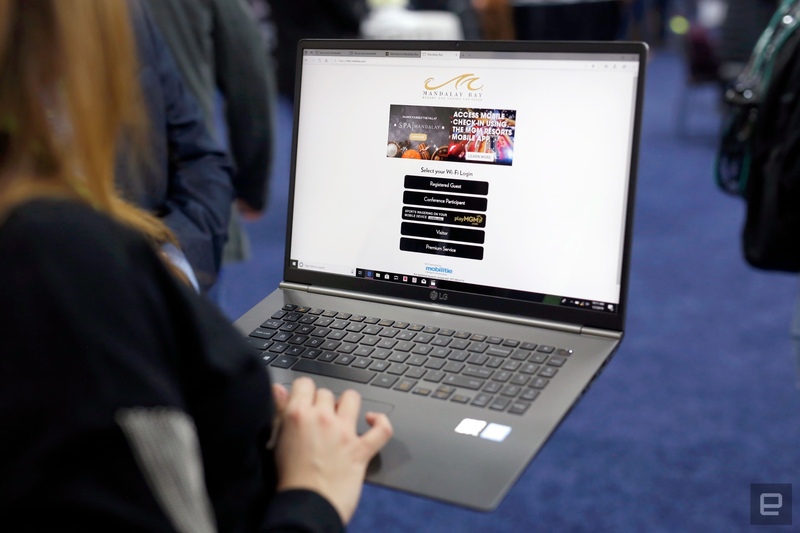 ASUS was the most prolific laptop maker at CES 2019 and the most experimental, to -- even if it wasn't an official exhibitor. It unveiled the ASUS ROG Mothership GZ700, a 17-inch laptop with a truly weird design. At the push of a button, a kickstand protrudes from behind the screen, and you can detach the keyboard completely, like a huge Surface Studio. It packs an Intel Core i9-8950HK CPU that's overclocked up to 4.78 GHz, a 1080p 144Hz display with G-SYNC support, up to 64GB of RAM, and three 512GB NVMe SSDs. There's no price or availability yet, but count on paying a bundle. Still on gaming, ASUS turned to AMD for its latest TUF laptops. They pack four-core Ryzen 2 3550H APUs and Radeon RX 560X discrete graphics, which should make for decent mid-range performance. Both models have military-spec toughness, and will arrive sometime this quarter. We should know the pricing soon. On the Chromebook side, ASUS unveiled its first Chrome OS tablet, the Flip C214, with a 9.7-inch QXGA display covered in tempered glass. It packs a rugged exterior, spill-proof keyboard and a 360-degree hinge. ASUS is also introducing the Flip C434 Chromebook with 360-degree hinge that converts into a tablet. It features a 14-inch NanoEdge display, an Intel Core i7-8500Y processor, plus a maximum of 8GB of RAM. Pricing for those Chromebooks has yet to be revealed, other than the Flip C434, which arrives later this year for $570. The updated 13.9-inch ZenBook S has the "world's slimmest" bezels, ASUS claims, at a mere 2.5mm thick. You can get it with an Intel Core i5-8265U or a higher-performance i7-8565U and up to 16GB of LPDDR3 RAM. Despite those decent specs, it weighs just 2.5 pounds. ASUS unveiled a variety of VivoBooks in 14-, 15.6, and 17-inch sizes. They come with Intel Core i7 processors and NVIDIA GeForce MX130 graphics for light gaming, and can transform into tablets thanks to the 360-degree hinge. There's no pricing or shipping dates for either the Zenbook or VivoBook models. If 3D modeling or video editing is more your jam, ASUS unveiled the more serious-minded StudioBook S. The workstation-class machine packs a 16:10 17-inch Pantone-certified 1,920 x 1,200 display that's essentially squeezed into a 15-inch body. And you can get it with professional parts, like a Xeon E-2176M 6-core processor and NVIDIA Quadro P3200 graphics, backed up by 64GB of RAM and 4TB of SSD storage. There's no word on pricing, but it'll ship in Q2 of this year. MSI has been killing it of late, with last year's MS65 laptop setting new milestones for lightweight gaming. It continues the trend at CES 2019 with the 17-inch GS75 and 15.6-inch GS75, with RTX 2080 Max-Q and RTX 2070 Max-Q graphics, respectively. The 15.6-inch model weighs just 4.19 pounds, making it one of the lightest gaming laptops you can get. If power is more important, however, there's the GE75 Raider, with a desktop-class GeForce RTX 2080 GPU. If small and light is what you need, how about this: Acer's Swift 7 laptop has a 14-inch screen that's bigger than the last model, but is just 1.9 pounds and 9.95mm thin. It'll be able to take on most PC chores (other than heavy gaming or graphics), thanks to the 8th-gen Core i7-8500Y CPU, 512GB of PCIe SSD storage, 16GB of RAM and 10 hours of battery life. You'll pay for those tiny bezels and slim form factor, though, as it'll start at $1,699 when it arrives in North America in May. On the gaming side, Acer flaunted its $4,000 Triton 900 laptop. The headline feature is the unusual hinge that tilts the 4K 17-inch screen in multiple ways, including a stylus-friendly stand mode. It also packs an 8th-gen Intel CPU and NVIDIA GeForce RTX 2080 GPU and up to 1TB of storage. 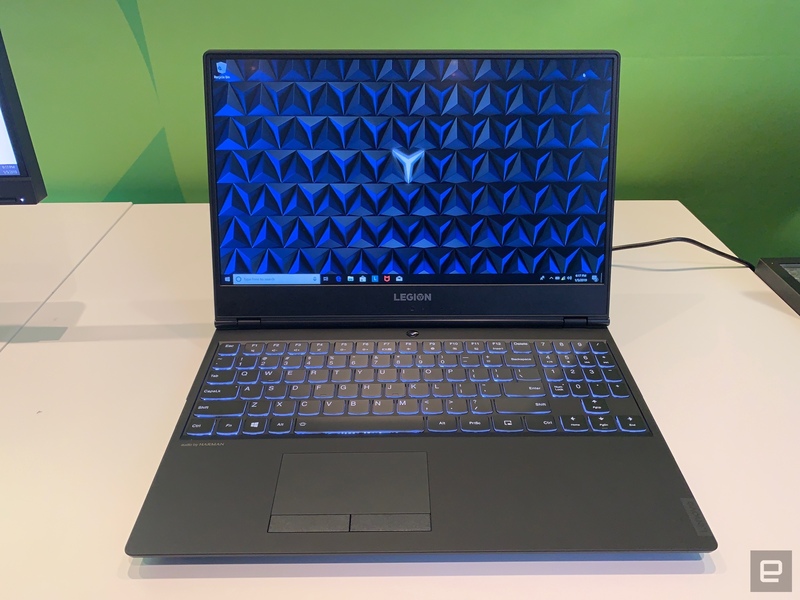 The Triton 500 is a more conventional and much lighter 4.6 pound laptop that also has NVIDIA RTX 2080 graphics and a 8th-gen Core i7 CPU. The Triton 900 will arrive in March, while the Triton 500 arrives in February starting at $1,799. 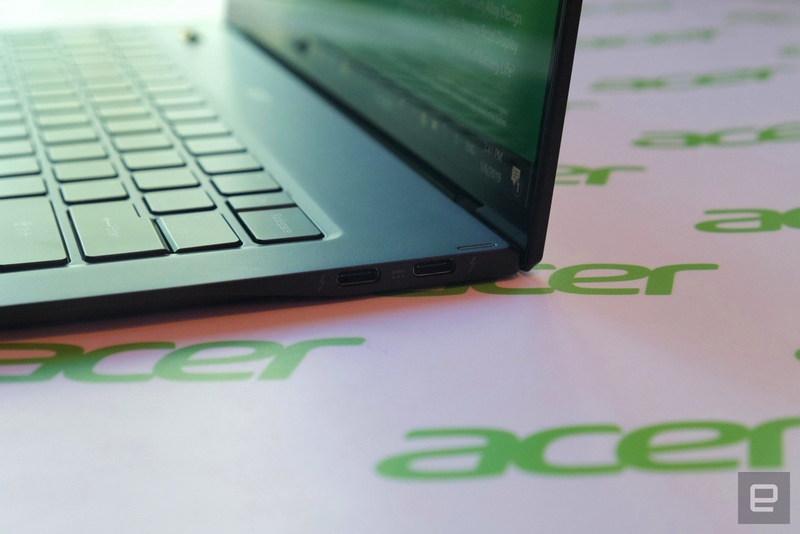 Getting away from Windows laptops and Intel chips, Acer also revealed the Chromebook 315, its first with an AMD chip. 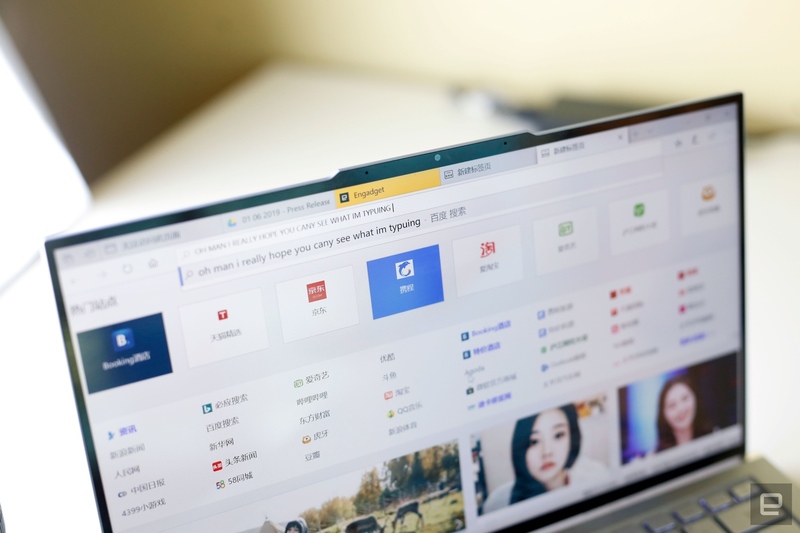 It comes with AMD's A4 or A6 dual-core processors with integrated Radeon graphics, so it should have enough power to run Chrome OS or Android apps. AMD chips are largely untested on Chrome OS, but considering it starts at $269 (and arrives in the US next month), the risk isn't too great. Lenovo's Legion gaming laptops have retained the subtle design of the last models, but luckily, the performance is now drastically improved. The Y740 15- and 17-inch notebooks are now available with NVIDIA RTX 2070 Max-Q and RTX 2080 Max-Q graphics, respectively, along with 6-core Intel Core i7-8750H 6-core chips and up to 32GB of ram. The 15-inch Legion Y540 packs a still-respectable RTX 2060 GPU and affordable $930 price, while the Y740 will cost $1,750 and $1,980 for the 15-inch and 17-inch models, respectively, and arrive in February. And while it's not a laptop, Lenovo's 27-inch Yoga A940 all-in-one is a serious rival to Microsoft's Surface Studio and costs hundreds less. It works with Lenovo's Active Pen Stylus and has a tilt-able display for graphics artists and designers. The hinge-mounted Precision Dial lets you swap tools and adjust brush sizes. You get a 27-inch 4K display, Intel Core i7 CPU and AMD Radeon RX560 graphics for $2,350 when it arrives in March. If you're looking for something between a notebook and tablet, Samsung unveiled the Notebook 9 Pen. As the name implies, it's all about the S Pen stylus, for artists and students who need to sketch or take notes on the go. It's pretty powerful for its petite 2.2 pound size, packing an Intel Core i7 chipset, up to 16GB of DDR4 RAM, a 512GB SSD and a 13.3-inch 1080p display. There's no price or shipping date yet. Samsung has never quite got gaming laptops right, but it's giving it another go with the Odyssey. It boasts very decent specs, running up to RTX 2080 Max-Q graphics, a 15.6-inch 144Hz 1080p screen with G-SYNC and up to 16 GB of RAM. However, most other gaming laptops can do that now, and the Odyssey is a bit, well, homely. It also weighs in at slightly chunky 5.2 pounds. The price has yet to be determined, but it should arrive in early 2019. LG's Gram defies convention for 17-inch laptops thanks to its thin profile and incredibly light 2.95 pound weight. With an Intel Core i7 CPU, 16GB of RAM, nearly 20 hour battery life and a 512GB SSD, it'll make the ideal multimedia machine, letting you watch movies all day long. Lightweight and thin comes at a price: $1,699 when the Gram arrives later this year. Origin's EVO16-S is a 16-inch gaming laptop that weighs a remarkable 4.5 pounds, lighter than many 15.6-inch models we saw at CES. Performance won't be a concern, as it boasts a 6-core Intel i7-8750H CPU, NVIDIA RTX 2080 Max-Q graphics, 1080p 144Hz screen and up to 32GB of RAM. The 17-inch EVO17-S packs similar specs and weighs 5.5 pounds, but if you need more grunt, the EON17-X's Intel Core i9-9900K desktop 8-core CPU and NVIDIA RTX 2080 GPU will do the job. Pricing or availability has yet to be revealed. Gigabyte has an interesting gimmick this year for its Aero 15-X9 and all-new Aero 15-Y9: It uses Microsoft's Azure AI to optimize gaming performance. If you don't care about that, both models are spec'd to the gills, with up to an i9-8950HK 6-core chip, 15.6-inch 4K X-Rite Pantone certified panel, GeForce RTX 2080 Max-Q graphics (RTX 2070 Max-Q on the Aero 15-X9), 64 GB of RAM and two M.2 NVMe PCIe SSD slots. All of that is packed into a 4.4 pound laptop that won't weigh you down. Pricing and availability are not yet available.